New York Makes First Award: A BIG LASER! Awesome NY have made their first selection! It was tough NY – you completely blew us away with amazing incredibly brilliant ideas. 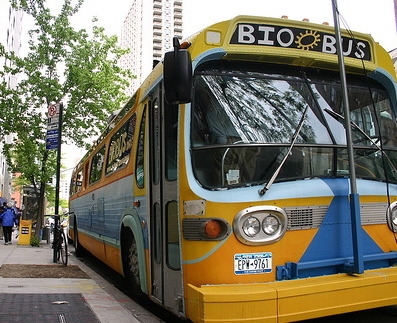 The BioBus is a mobile science laboratory. Students on board explore the world around them with research-grade microscopes, and make their own discoveries under the guidance of professional scientists. The BioBus has proven to be an innovative, effective, and attention getting vehicle for science education. Ben has been named “New Yorker of the Week” by New York One and have been recognized in regional, national, and international press for this innovative approach to bridging the “science achievement gap.” A laser tractor beam will be an awe-inspiring addition to the BioBus’ repertoire of excitement generating yet sophisticated tools and experiments. “How many projects are part lightsaber and part Magic School Bus combined into an awesome science adventure? First, I will build a laser tractor beam on board my BioBus. Then, during normal BioBus school visits, students and teachers from underfunded schools in the Bronx and across the country will perform their own experiments by poking, prodding, and perturbing cells using the tractor beam. I will document and publish the construction process in an open-source science education journal, allowing schools and science nerds around the world to build tractor beams of their own. Every time someone uses the laser tractor beam to hold a bacterium still while they produce a movie of cell division, and then feeds those bacteria to a ravenous amoeba, they will have no other choice but to blurt out, “Awesome!” With extensive experience building laser tractor beams and as founder of the BioBus mobile science lab, I am the only person in the world prepared to do something this awesome. Ben will also publish his protocol for building a cheap laser tractor beam via the open-source PASTE project journal.